Note: preregistration is required! Use the ticket order form below. you have placed me here in the midst as witness, as awareness, and as joy. What wisdom does Merton offer us for the journey? What does Merton have to teach us about joy? 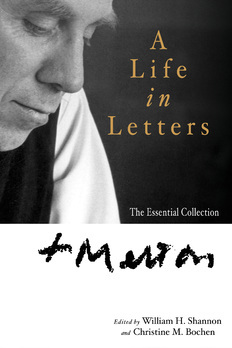 Drawing on Merton’s life and writings, we will explore and reflect on three aspects of joy: the joy of being human, the joy of friendship, and the joy of unity. Christine M. Bochen is professor of Religious Studies at Nazareth College, Rochester, NY, where she holds the William H. Shannon Chair in Catholic Studies. A founding member and past president of the International Thomas Merton Society, she edited Courage for Truth, a volume of Merton's letters to writers, Learning to Love, the sixth volume of Merton’s letters, and Thomas Merton: Essential Writings; co-edited Cold War Letters and Thomas Merton: A Life in Letters; and with William H. Shannon and Patrick F. O’Connell co-authored The Thomas Merton Encyclopedia. Most recently, she edited a collection of essays entitled The Way of Mercy (Orbis, 2016). Time: 9:30 - 4:00 p.m.
Members will need to renew their annual membership for the new 2017/18 season before registering for this event. To do so, please visit our membership page and register to renew your desired membership level. Then return here to register for this event. Dr. Bochen will be available after her talk to autograph her books. All are available for purchase online; click on each of the book covers below to visit the publisher's page for that book.